Giving an electric home diffuser such as the high capacity aromatherapy essential oil diffuser as a housewarming gift or birthday gift is indeed a lovely gift idea. The Quooz Lull essential oil aromatherapy diffuser with auto shut-off feature produces high ultrasonic electrical vibrations to create an ultra-fine aromatherapy mist and a lovely aroma from the essential oils used. 3 – 5 drops of your favorite quality essential oil is all that is needed for the electrical diffuser to work filling your room with instant cool hydrating mist and pleasant aroma. With a 200 ml capacity, the Quooz essential oil diffuser offers a long diffusing time of 8 – 10 hours, perfect for those who want to operate it through the night. Its auto shut-off safety feature ensures that the diffuser automatically shuts off when water level is low. It comes with an adjustable soothing light. You can adjust the light to your preferred brightness or you can set it to a gradual increase in brightness and then slowly fading down with each cycle resembling the frequency of human deep breathing. 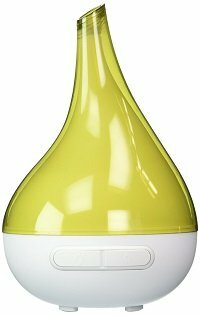 With no condensation problem and a stylish compact design, this Quooz Lull aromatherapy essential oil diffuser offers a great way to enjoy the benefits of essential oils and their healing properties. Relief stress, relax and rejuvenate with the Quooz Lull high capacity aromatherapy essential oil diffuser in your bedroom or any living space. It comes with an AC adapter and a user manual.